A good Law Reporter is a necessity for the Bench as well as the Bar. It is our good fortune that judges of sterling qualities and eminence adorn the Bench of the Gujarat High Court. Advocates who were formerly practising in the appellate side as well as criminal side of the Bombay High Court have voluntarily shifted to Gujarat and are now practising in Gujarat High Court. Advocates outside of Ahmedabad and even some from the other districts of Gujarat have started their lucrative practice in Gujarat High Court and have increased the strength and dignity of the Bar. When we think of the galaxy of the Bench and the Bar in Gujarat, are aware of the difficulty and enormity of the task we have undertaken. In our Constitution, the Rule of law is supreme. The Constitution also enshrines the fundamental rights of the citizens, important remedies, for the redressal of grievances regarding fundamental as well as other rights. The High Court is par excellence the upholder of those rights. In this role, the High Court has been playing very important role and is developing a new branch of law. This increases the need and importance of competent and accurate law reporting. 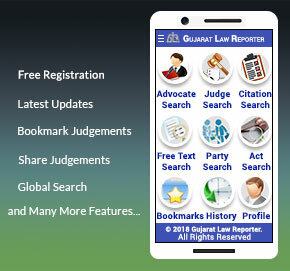 We incorporate in our Reporter the authoritative pronouncements of the High Court of Gujarat and also reporting some landmark judgments of Supreme Court also. The public is also becoming aware and conscious of the role of law and Law Courts in our social and political life. An average citizen has begun taking active interest in legal problems. We have to keep in view the requirements and expectations of this new breed of readers also. It is our endeavour to combine precision and fullness with lucidity and easy intelligibility. We will be publishing some important (new) statutes also. We invite opinions and comments from lawyers on difficult and disputed questions of law. We need hardly to say that we are always open to corrections and we shall be obliged if any of our readers point out mistakes, oversights or slips. We hope that in course of time, we will be able to achieve a fair measure of utility to our readers, by their valued co-operation and good wishes. We will be failing in our duty if we do not express our deep sense of gratitude and indebtedness to their Lordships, who gave their unflinching support, guidance and co-operation. We also take this opportunity to thank the members of the Bar as well as the members of the staff of the Gujarat High Court for their co-operation and active participation to treat GLR as their own.